I am now less than one month from my Ironman. I have been training for eight months and have missed only a few days of training. How do I stay motivated? Today I share a few tricks. I just cracked the 3K mile mark. That means that if instead of doing loops and returning home for all of my workouts, I kept going east, I would be in New York, almost to Manhattan. Crazy. If you look closely in August you’ll see two weeks that are low. Half way through a key week in my training, I picked up a cold that kept me in bed until the middle of the next week. Thankfully the second week was a planned rest week, so once I felt better, I used it to get back on my feet slowly. The hardest part of getting sick, for a guy like me, is resting. I have to force myself to watch movies, otherwise I’ll start doing things around the house and get worse. After I started to feel good enough to do normal things like get out of bed and go to work, the debate about when & how to start training kicks in. The trouble is that if you start to soon & too fast, you can get sick again or get an infection that will take you out for even longer. I have heard horror stories of athletes that started up a few days too soon and ended up missing a whole month after that due to infections, some of which even required surgery. I probably could have run again on day 6, but decided to take a full 7 days off and start up on day 8. It turns out that missing 7 days only costs you about 1-3% of your fitness, and that is quick to recover once you get a few quality workouts in. My goal was to be recovered by the last weekend in August because I had a planned trip to Lake Tahoe to do a practice run of the course. I had planned to get up to Lake Tahoe on the weekend four weeks before my race. That is about as late in the season as you want to have a really hard & long workout but it is close enough to the race that it will closely simulate actual weather conditions. 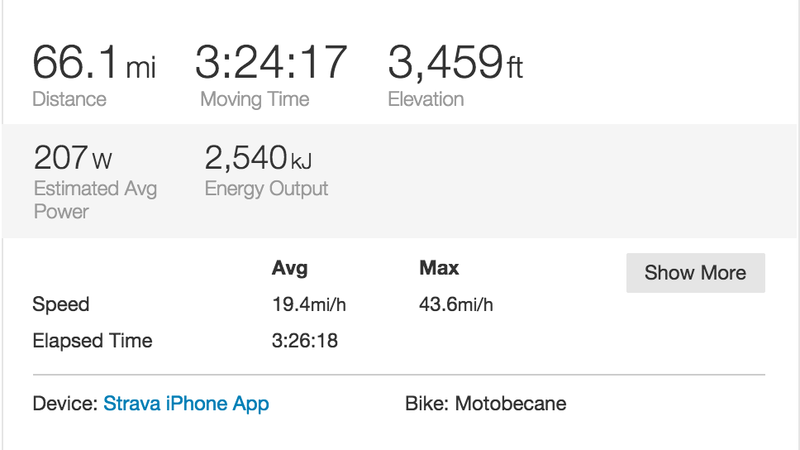 I signed up for an organized swim race on Sunday, so Saturday I planned to get familiar with the bike & run by doing a metric Ironman. What is a metric Ironman? Well basically you bike 70 & run 16. They call it the metric Ironman because the distance is about equal to 112 kilometers on the bike and 26.2 kilometers of running. The reason this workout is ideal is that it gives you a chance to attempt your planned race pace for just over half of the distance. The idea is that if you can do that ok, once your body is rested from your taper, you’ll be able to do the full distance at about that pace if you really dig deep. As you know, my goal was to qualify for the Ironman World Championships in Kona. The men in my age group that qualified last year did the course in about 10 hours & 20 minutes. Guess what my target pace is? I planned on doing that by swimming in 1:10, biking in 5:30 and running in 3:30, with an additional 10 minutes for transitions. That totals to a bike pace of 20.4 mph and a run at 8 minute mile pace. Those are all doable for me individually but stringing them together would be the challenge. 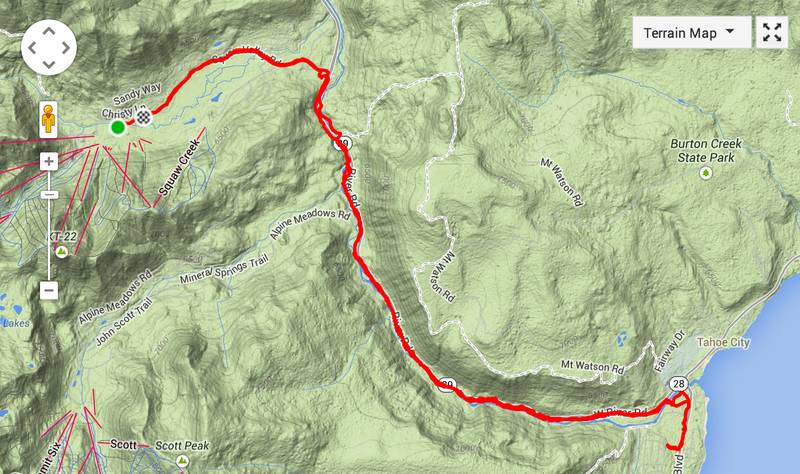 An then there is the fact that this race takes place at 6K feet, which means there is less oxygen in the air. This practice would be the perfect way to figure out how my body would react. From the stats below you can see that I did pretty well. I was a bit slower than intended, but only by 1MPH. 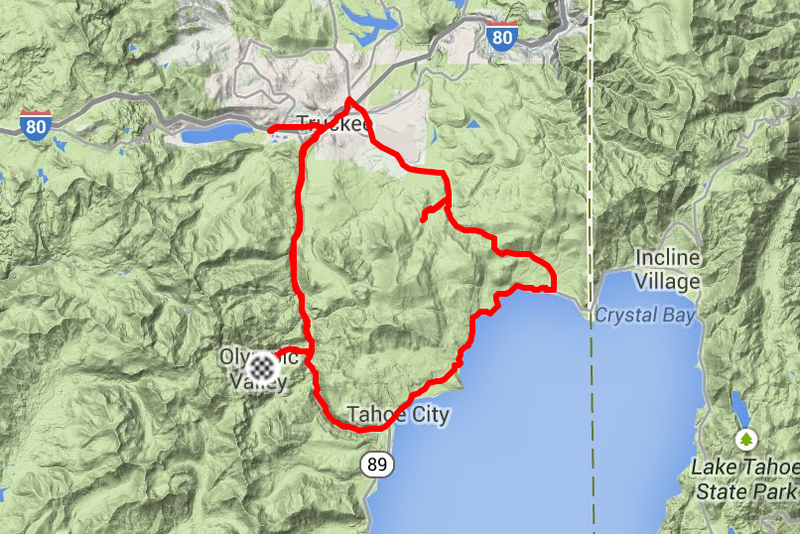 I hadn’t memorized the entire course, so I missed a few turns in Truckee and by Tahoe City, but I was able to get most of the loop in. The important part was the big hill I’ll have to climb twice. It started out fairly mellow, but by the top I understood why everyone complained about it. It gets increasingly steeper as you go. I’ll make sure to save some juice for the last half mile. I had parked at Squaw Valley, so that I could practice the run course in its entirety. Basically it is a double out-and-back so even though I was only running 16, I’d actually get to see the whole course (and even a little extra). I started out just under 8:00 pace and though my legs were a little awkward after being on the bike for 3.5 hours, I was feeling good. One bottle of water and a gel pack later and I was turning around at the 8 mile mark. In the chart below, the blue line is my pace, which is measured on the axis on the right side. Since I’m using GPS tracking, small variances are expected, which is why it looks a bit wavy. Now I want you to look at the chart and tell me when it was that my stomach started to hurt. Did you guess the 12 mile mark? Well you don’t have that much faith in me do you? My stomach started hurting at the 10 mile mark and I tried to tough it out for a bit. I actually kept my pace pretty well and then it all fell apart at 12 miles. I had run out of water, couldn’t find a fountain and was starting to feel pretty bloated. I’m not sure if what I got was altitude sickness or just the result of a poor nutrition strategy, but my stomach basically decided to shut down the show. I walk-jogged the final three miles and was glad to be done. One thing I pride myself in is always turning failure into a learning moment. What did I learn from this? Eat less. I had mixed a bottle of my Hammer Perpetuem and took it with me for the ride. I forced it down over the 3.5 hours without thinking. That turned out to be ~600 calories per hour, which is WAY too much for me to process. That is probably why I felt so bloated. I had been aiming for ~300-400 and plan to stick on the lower side of that. Water is key. Thankfully this will be provided every mile along the run. During my practice I didn’t have that luxury and it cost me. Go a bit easier on the bike. I had been planning on splitting my energy of the day fairly evenly. I was aiming to output a consistent 200 watts. You can see from above that my bike was at~207 for the practice. An 8:00 mile pace running requires about 200 watts as well. After failing, I did some searching for the cause and ended up finding a great article about Ironman pacing. Basically it argues that you have a fixed amount of energy you can output, and that on the bike, due to wind resistance, you wattage is taxed more before it turns into speed. So, according to this theory, the more energy you can put into the run, the faster your overall time will be. He argues that I should aim to hit 180 watts on the bike and 220 on the run. That would be about 6:15 and 3:15 for me. Not as fast as I had hoped, but probably possible. Negative split the run. This I know as fact from my running days. A negative split means the second half of your race is faster than the first half. Almost all world records have been set by someone running a negative split. The reason is that evenly pacing is the best way to run, and the people that are close to setting world records just happen to dig a bit deeper at the finish, thus returning a negative split. For me this is especially true. Mentally, when I see that I can no longer hit my goal, I tend to give up and just finish at 85% effort. When I am coming from behind though and it seems possible, I get fired up by the crowd and dig for energy in place I didn’t know I had. I get energy from passing people and get drained by being passed. That said, the best way for me to finish my Ironman will be by passing people towards the end. I plan on starting at ~10 seconds per mile slower than my goal pace, dropping to goal pace at the 13 mile mark and when I hit mile 20, using everything I have left to make up those lost two minutes. If it works as planned, I will be passing a bunch of people, getting cheered on, and finding motivation to keep digging. I practiced this yesterday in a 16 miler where I started at 8:00, turned around at 8 and started accelerating. Mile 15 came in at 6:22. I’m hoping that translates into the race. How do I stay motivated to get my training in every day? 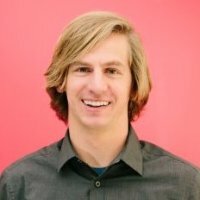 How do I make sure that even with family, work, commitments I am able to find time? Here are some tricks I’ve picked up. Let me start by saying that none of these are reasons to do an Ironman. The only reason to try an attempt an Ironman is because you are insane. Once you’ve decided that though, you should go all in and stick to your goal. These tricks can help you do so. If you try and plan every workout for the season on day 1, you will get off course and get discouraged. If you try and decide what to do every day, you will not have a strategy and will go too hard or too easy based on how you feel. Things come up in life, you need to be flexible. The best way to stay motivated is to have an overall season plan with goal miles for each week and an idea of how many quality days you need to get. That season plan should be adjusted periodically according to milestones, injuries or circumstances. Do this with great consideration. Then, each week, you will have a number of miles and a number of quality workouts. Fit those into your week. Think about work meetings, dinner plans, pool hours, etc. and make you week work. The great part about a week is that you can borrow from one day if you need to. Is Tuesday booked? Go for a short run in the morning and push some of the miles to Weds, you’ll be ok. Even if your week ends up a little short you’re going to be ok. You can see below my plan (that I have adjusted a few times as necessary) in blue and actual results in red. I’m just shy of plan almost every week, with a few being particularly bad. But guess what, I am in great shape right now. The easiest way to get off course is to start thinking ‘it is ok if I miss today, it is just one day.’ I have trained myself to despise missing days, even when I know it is best for me (see above about being sick). Sometimes you actually have a planned rest day or have low enough milage that you don’t need to do a workout. One those days, get dressed in your workout clothes and do something. Stretch, do some sit-ups, ice a sore muscle. That will teach you that you are actively prioritizing what you need for that day and that you are sticking with your plan. Each week that goes bye that you don’t miss a day, makes it that much easier to not miss a day the next week. I straight up deceive myself and have been doing it for years. Some days I look at my workout and see something that makes me want to crawl under my bed and hide. Maybe I’m feeling tired or just worn out and then I look and see 10 miles with 6 at Threshold pace. Uuuggghhh. This is when I trick myself. I agree, with myself, that I probably need rest and I’ll just go out and do two miles easy and call it a day. Guess what happens once I get dressed, go jog two miles and stretch? That is right, I feel much better and most of the time I actually get my planed workout in. Sometimes I really can’t do that and maybe my day is something like 6 or 8 easy, but that is still MUCH better than doing nothing would have been. I have a playlist that is basically just pump up songs. Once in a while I don’t feel like doing anything and so I start up the playlist as I get dressed. The worse I feel, the more I drag my feet while getting dressed, and so the more pump up jams I get exposed to. By the time I finished getting dressed I’m usually feeling motivated enough to get out and run. Accountability to others is huge. My wife and family share in my goal and frequently ask how I’m doing. Some days I share with my wife that I feel like quitting and she helps encourage me to just keep at it, that I’ve already come this far. Sharing with friends also helps me. I’ve taken to Facebook to help me get over one of my biggest hurdles, training while on the road. When you’re flying in for a work meeting, it is pretty tempting to skip the day, but I’ve made a point of sharing pictures of me working out in new cities as a way of motivating me to get out and do something. Thankfully my friends enjoy seeing the pictures I put together of various places and so it motivates me to do something unique so that I can get a good shot to share. 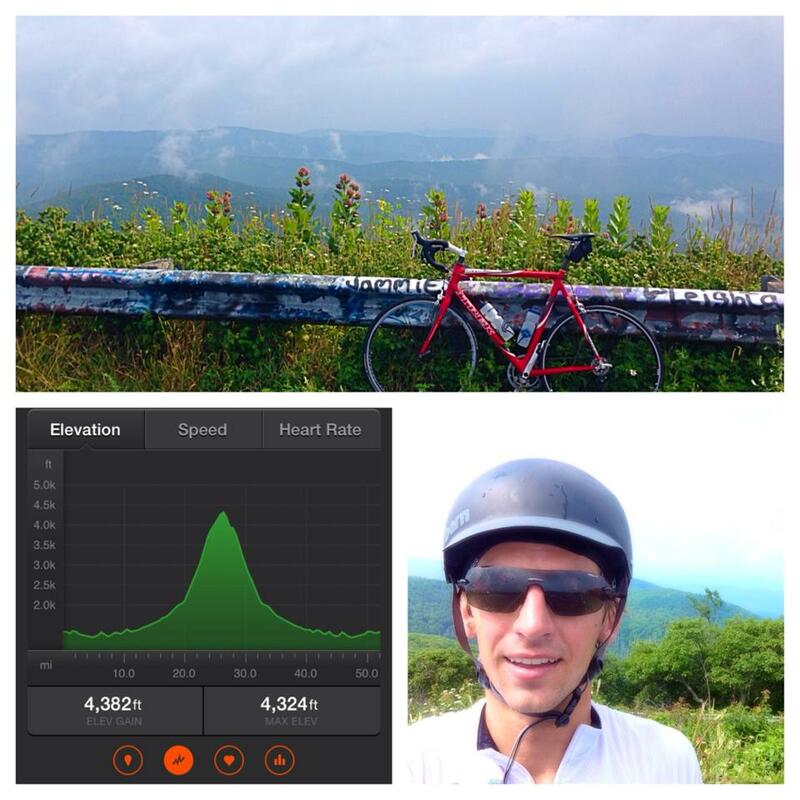 Here is an example from a trip to Virginia where I rented a bike and rode up a mountain to the border of West Virginia. 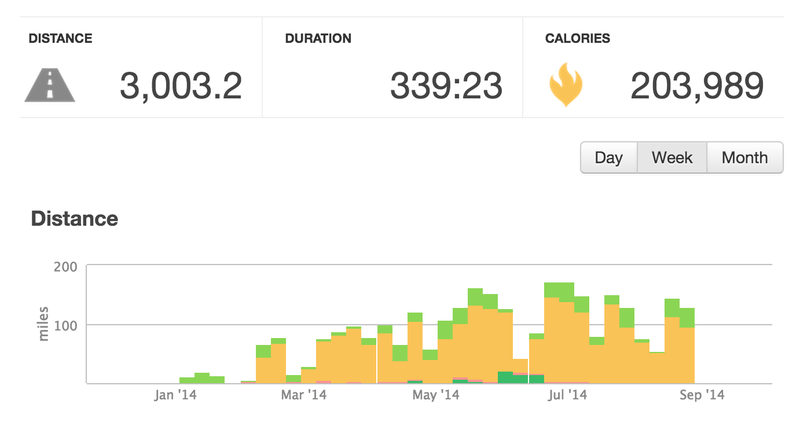 I also use Strava to track my runs & rides now. I’m connected to a few friends who will comment when I have particularly good workouts. I do the same for them. Finally, I share publicly as well. Look up above at my training data. By posting this online once per month, I am using the entire internet population (both now and in the future) to hold me accountable. I know that if I slack off, there will be a permanent record, so I make sure to get my miles in so that graphs look good. I should stress though, part of getting accountability is being willing to be honest about your failures though. See the run I talked about above, I wish I didn’t have to document that. I wish I could just tell everyone it went great. But if I hid things like that, the accountability wouldn’t be much good would it? They whole point is they have to know whats up so they can encourage you properly. I didn’t mention using a coach or joining a team because I am self-coaching for this Ironman, but those are also great sources that I’ve relied on in the past. A coach will know how your training is going even better than you do because they can look at the data objectively – a good coach will be able to tell you when you need to work harder and when you need to stop working so hard. A team will give you someone that misses you if you don’t show up. You need to return the favor. If someone doesn’t show up for Wednesday track practice, ask them what was up. Maybe they had a good reason, and if so, don’t go on about it, but just by asking them, you’re giving them reason to make sure they make it next time if they don’t have an excuse.